May | 2018 | Azazel's Bitz Box. Today’s post isn’t a newly painted, but it’s one that I’ve given a new base to as well as a little bit of touch-up, so it counts as a “Neglected Model” in that it’s now up to 2018 standard. It’s a model I actually thought I’d posted up here before, but it turns out that I can’t find any reference to it. 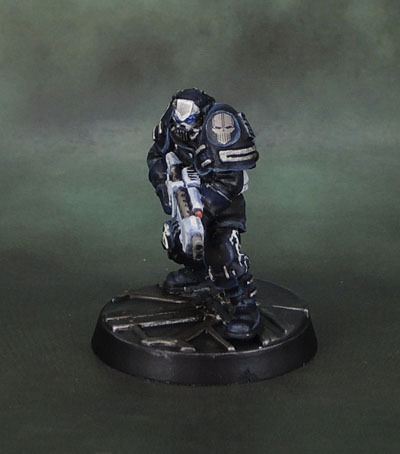 The figure itself is a mercenary-type hero for WarZone 1e – in other words any Corporation could pay the points and have him in their force, excepting the Dark Legion, though they’re not actually a Corporation. Still, his stats aren’t important. Nevermind the sporran – Check that belt buckle! 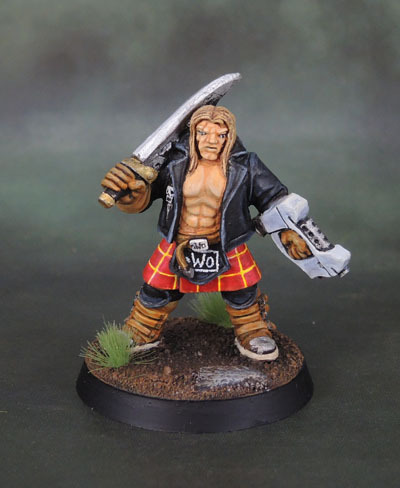 What’s important is that I saw a cool model while I was busy painting my Cybertronic dudes as nWo wrestler, so what else could I do with a muscular dude in a kilt, a leather jacket and no shirt? 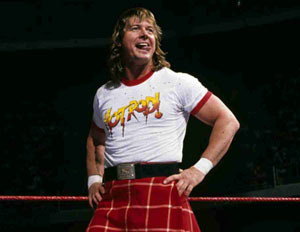 Roddy Piper with classic t-shirt and kilt design. 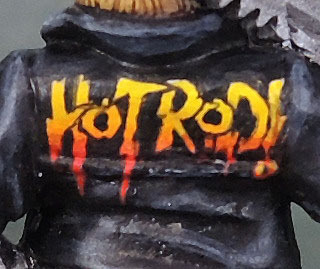 Roddy with Hot Rod design on black t-shirt. 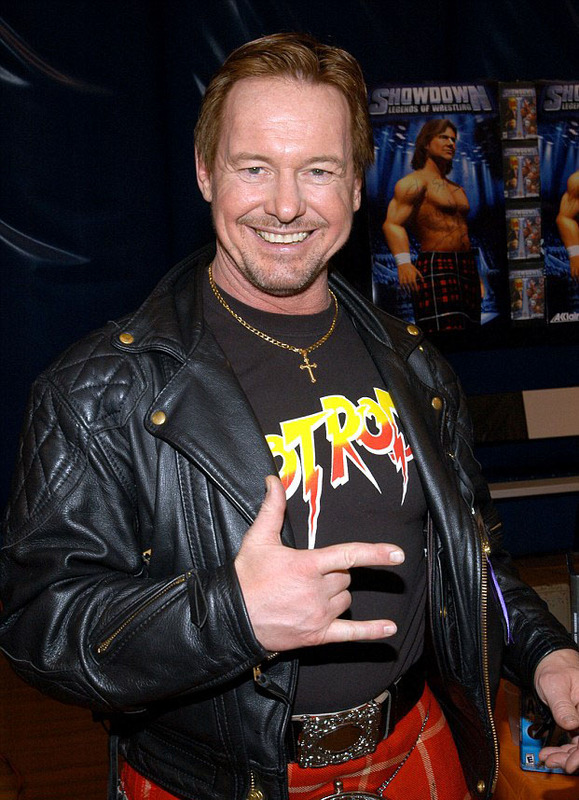 Yeah, Roddy Piper, amirite? I painted him with the sandy-brown hair that he had earlier in his career, during the Rock’n’Wrestling/Wrestlemania 1-3 era. 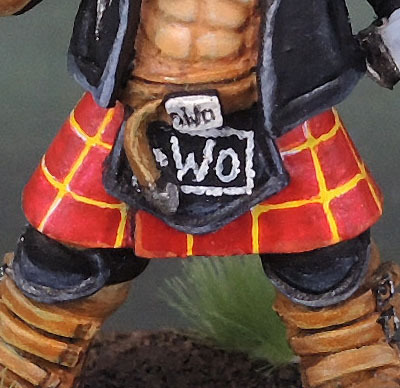 One thing I noticed when I painted him though, was a facial likeness to another, more recent wrestler of the mid-1990’s. So that was an interesting find once I had him painted. A few other people have pointed it out over the years unprompted, so it’s not just me, apparently. Anyway, whether it was Piper or Triple H cosplaying, there’s still the jacket. 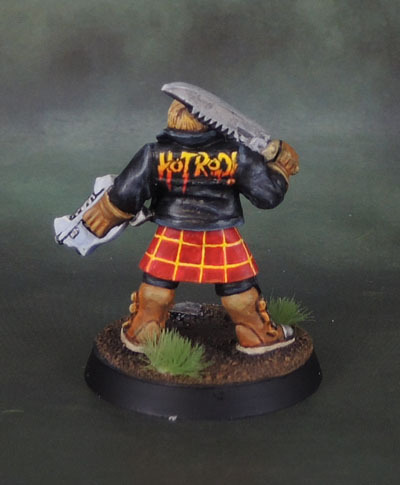 I don’t think Roddy ever had a jacket with the logo emblazoned on the back of it, but since he had no t-shirt, what could I do? 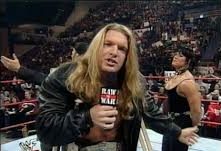 These days, Ronda Rousey is wearing Roddy’s actual jacket around the WWE as he gave it to her, along with his blessing to use the “Rowdy” moniker before his passing. 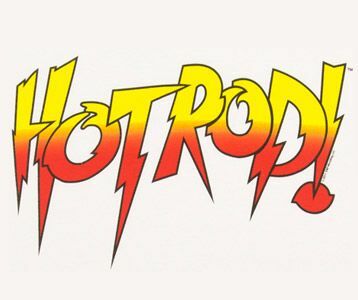 Roddy Piper’s Hot Rod! logo. 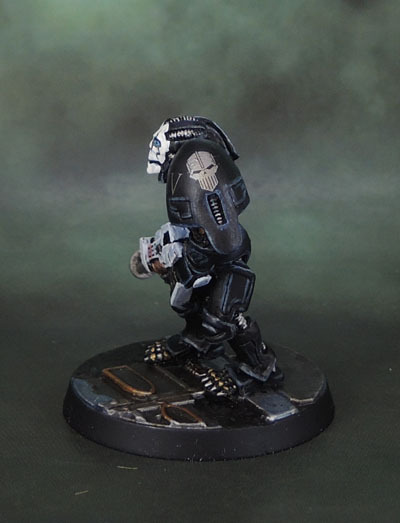 Yet another of my old 1st edition WarZone models here, and yet again – finally completed – and with some modern touches and a modern base added. 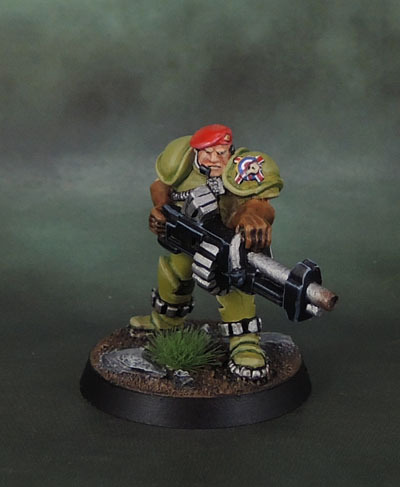 We have a Cybertronic Atilla III Cuirassier with a small conversion – the barrel end of his Assault rifle have been replaced with the multi-barrels of the SSW4200P HMG, cut off a Chasseur HMG gunner. As with about half of these old figures I’ve been showing and finishing so far, this one is still available from Prince August’s website. 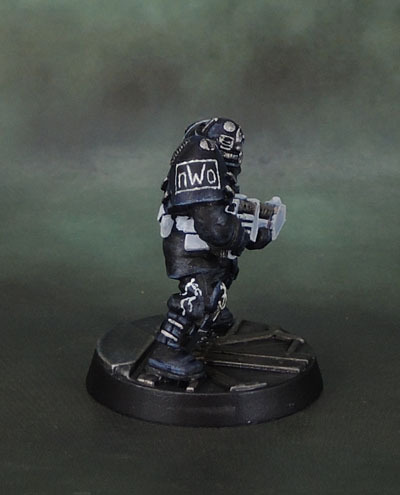 Once again we have the Black and White of the nWo, as well as some other references to The Man Called Sting, who’s pre-Wolfpac outfit of the day fit in with my black-clad Cybertronic. (No, he’s not nWo Stong/Black Scorpion). 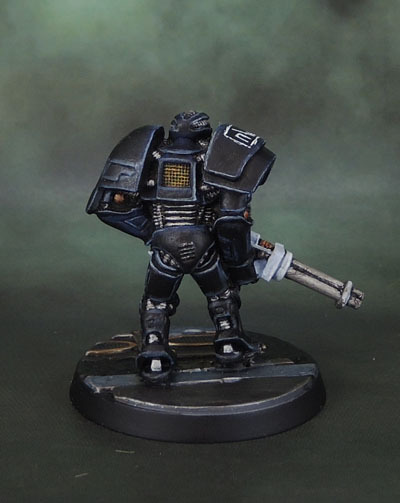 Newer touches have included, erm, finishing the right shoulder and both legs, rebasing onto a “tech” 40mm, and of course the addition of the Iron Warriors Icon and the Legion’s “IV” badge to the left pauldron. 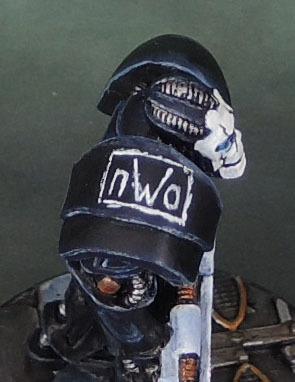 The nWo logo on the right Pauldron is original nWo-era freehand. 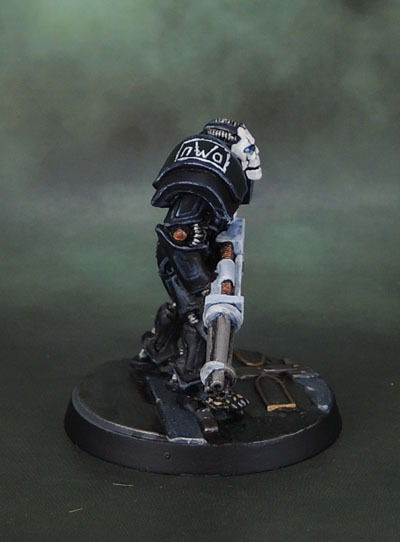 Iron Warriors have no qualms about using War Servitors or fully robotic versions of AI, so while I’m not 100% what I can use this guy as in 40k, I’m sure I can find a unit entry that will work for him just fine. 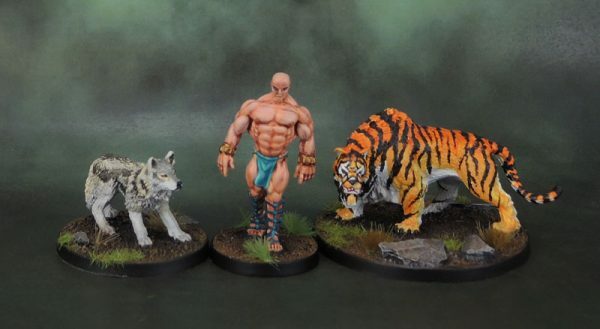 Today we have a model from the Conan Kickstarter once again. 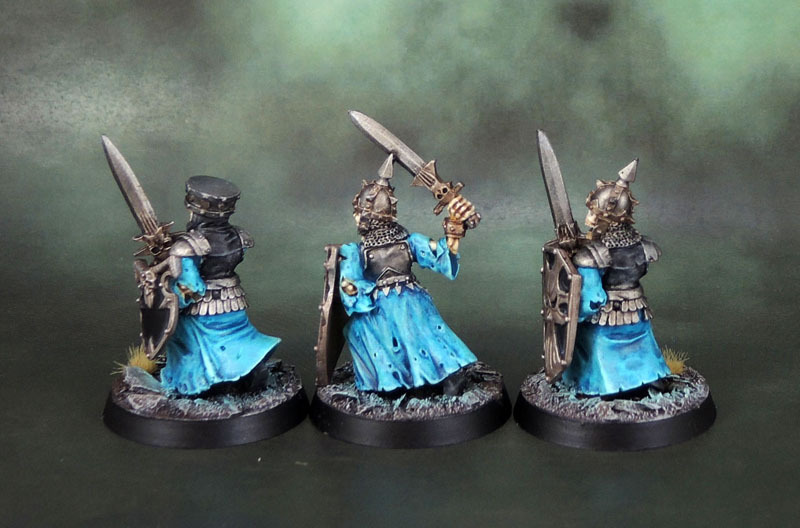 The model is of a Conan character called Baal Pteor, or on the box, Baal-pteor. (I keep thinking of him as Baal Predator. I wonder if that’s a subtle pun on GW’s part?) He was a paid add-on from the Conan Kickstarter, and cost me ten bucks. Kickstarter text: “The Strangler” as he is known is a cold blooded murderer. A new leader minion, he comes with his own scenario as well as guidelines for integrating him into others. 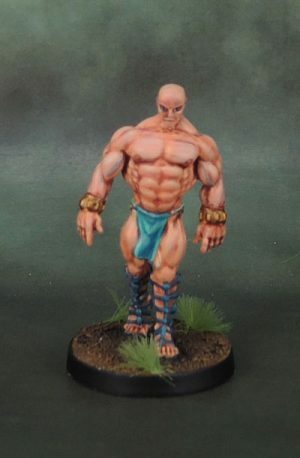 I picked this model out of a stack of boxed add-ons to paint entirely because of his appearance – basically a buff dude with a loincloth, bracelets and sandals. 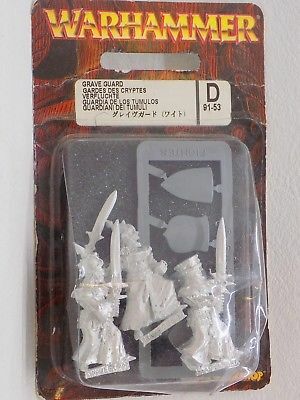 Or to put it another way – a simple model to paint as almost the entire thing consists of flesh tones, followed be a chance to discard the giant box that a single tiny model and a couple of cards came packaged in. Now, I pretty much know nothing about Conan. I’ve never read Howard’s novels or stories, and my total experience pretty much amounts to the two Arnie films and the single 2011 film that shares a name with Arnie’s original, and very little else. So I used the box art as my rough guide to painting. Once I had pretty much finished the flesh, though I went with shaved bald rather than short stubble for the head, I got online to work out what colour(s) to paint his accoutrements. I also stopped to find out who the hell this guy is. Mostly since I wanted to note whether he was a player hero or an “Overlord”-controlled hero. 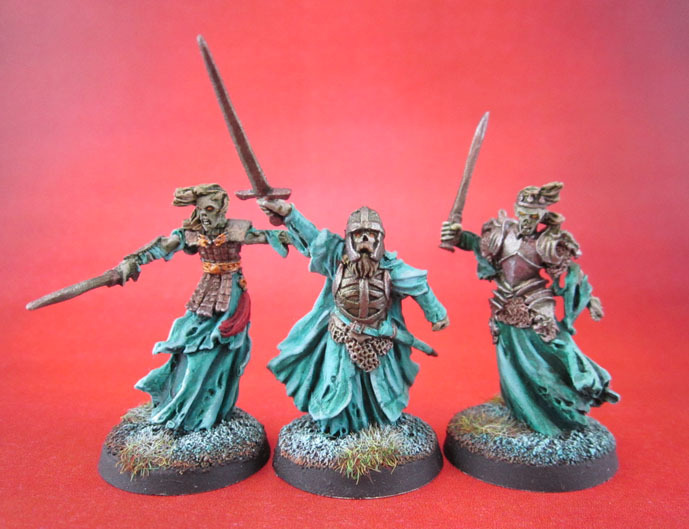 Alongside my only other painted Conan models. Well, the wolf is one of ten, but you get the idea. And then I find that he’s “a Kosalan strangler of Yota-pong” who is described as “a black man from the lands of Kush“. Uh. Huh. So where or what is Kush or Kosalan? Wikipedia: Kingdom of Kosala was an ancient Indian kingdom, corresponding roughly in area with the region of Awadh in present-day Uttar Pradesh. Oh, right. Ok, where is that? North-Eastern India. So… I guess from the regional and physical descriptions given, Baal Pteor should be panted as a darker-skinned Indian. I guess it then makes perfect sense that the artwork shows a character that’s clearly European. I’ve heard that the developers were careful to reinterpret various Howard characters so as to appear less racist (though sexism was apparently not a huge problem), though I’m not sure how “giant dude who is stronger than Conan and fights him” is inherently racist regardless of what ethnicity giant dude happens to be. I’m kinda ambivalent to the whole series of arguments either way, but I’d personally rather have painted the character as he’s “supposed” to look. Still, the flesh is all done, and I’m not repainting him now. Go home, Baal. You’re drunk! He’s got a bit of a lean to him as well, that I only really noticed once I had cleaned, primed and base coated him. In person it varies between looking like a lean and like part of a swaggering gait. otherwise, I feel that he looks pretty decent, all things considered. 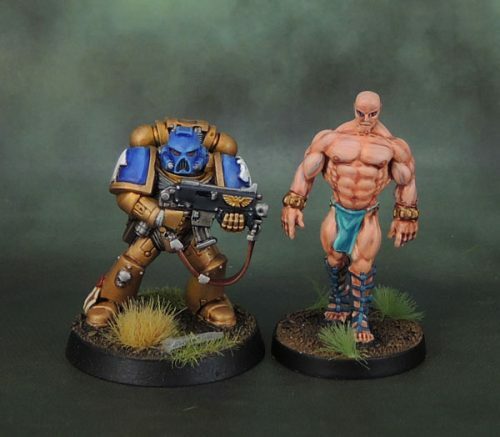 I’m happy with the flesh tones and musculature, though he would have been a cool figure to paint with dark skin as well (Bobby Lashley, anyone?) Less happy with how the eyes came out, but as you can see via the Marine comparison pic here, he’s much more truescale than GW figures, and a bit of a weird looking pinhead to boot! Then again, a bit of eyeliner fits in well enough with his pretty coin-fringed loincloth and fabulous bracelets, so who’s to say? Yet another WarZone model today. 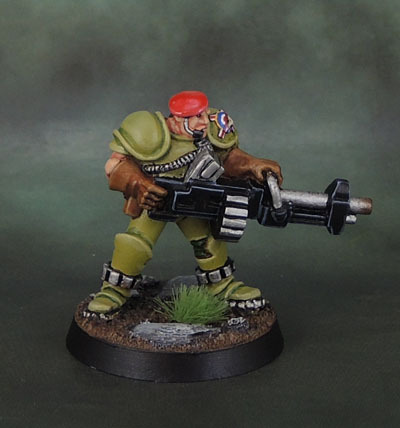 This one is a 2nd-generation Cybertronic Chasseur resculpt that came out towards the end of 1st edition. The original Cybertronic Chasseurs tended to be bare-chested or singlet-clad bald guys with guns. They were also one of the better-looking factions in terms of models back then (to my eye, at least) and as one of the gaming group of the day elected to run a campaign, and Imperials were already taken (by two other players – who used different aspects of the Imperials – Berets and Trenchers from memory) I went with the Cyber-boys. As they were generally half naked, muscular dudes, and we were in the midst of the nWo era of wrestling at the time (leading into the “Attitude Era”) my Cybertronic (and other) guys ended up with some wrestling influence. 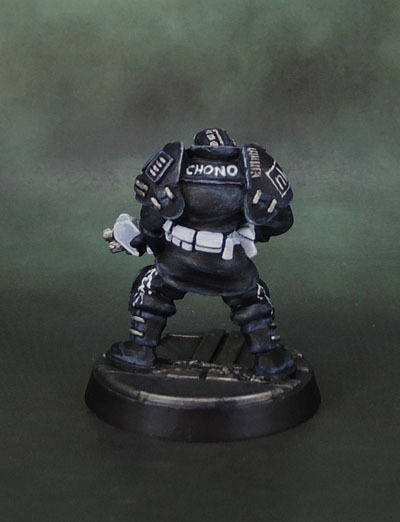 In any case, I followed the nWo theme, and this model was named “Chono” in honour of Masahiro Chono, a wrestler from New Japan who was a leader of the nWo Japan chapter of the nWo. The model’s pants have the lighting bolts on them in homage to Chono. 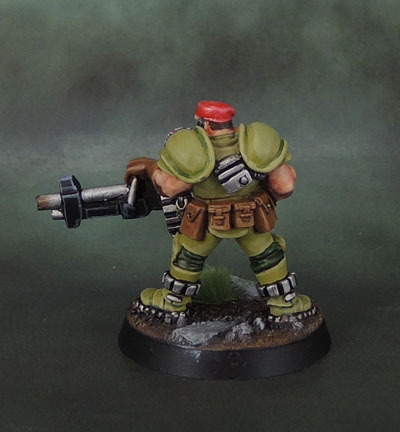 Today we have another WarZone 1st Edition model that I’ve literally just finished up and photographed – an Imperial Blood Berets HMG Specialist. Again, this one is still available from Prince August for anyone interested in picking one up themselves. I started this model back in the 1990’s but never finished it. 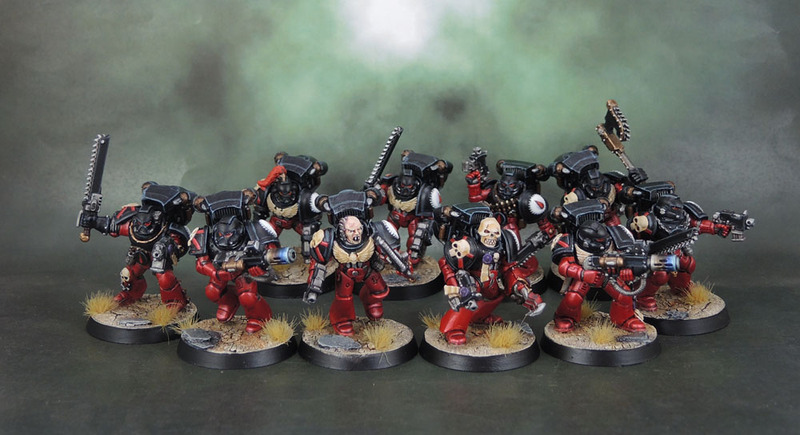 I actually collected enough figures for an Imperial force in WarZone – both the standard English/British models as well as the Highlanders, but never finished painting any of them or managed to play with them. At least I’ve now finished one of them! 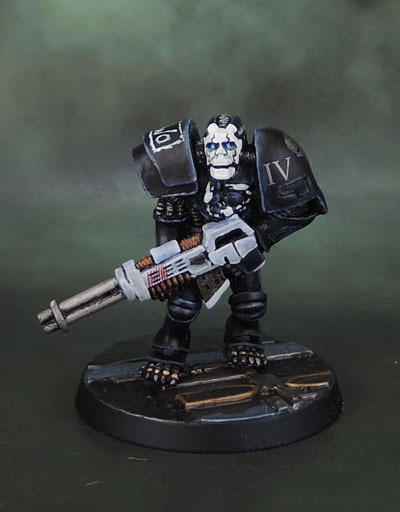 I quite enjoyed freehanding the Imperial icon on his shoulder, and adding in a beret badge with paint, using shades to attempt to make it look like an actual sculpted one. 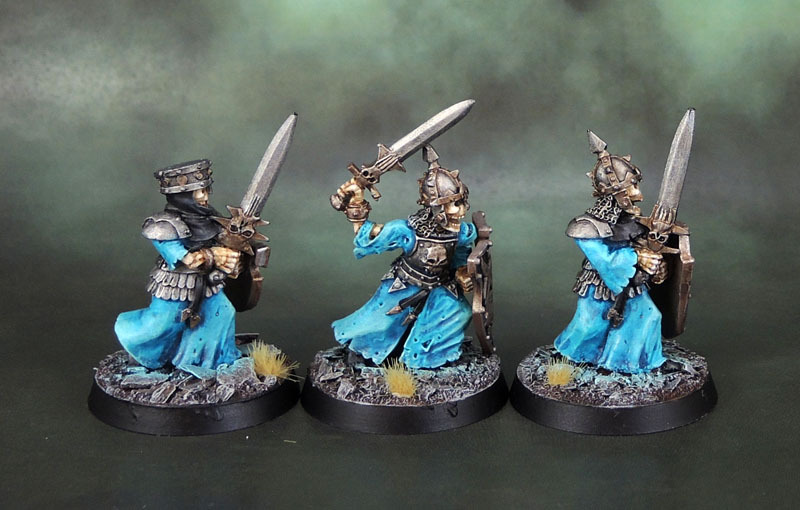 The reason I picked this one to paint back in the day was simply because I liked the model, but on a related note to that, it got put aside and forgotten as I didn’t have any pressing reason to actually complete it. 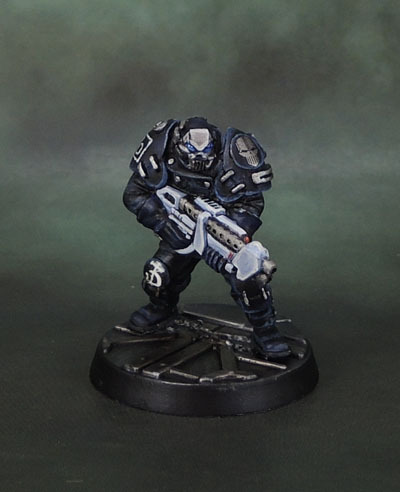 Not that there was too much to do, but finding him so close to completion last week in the WarZone case led him to getting pulled out, given a new 32mm base and having those last parts of the model completed. 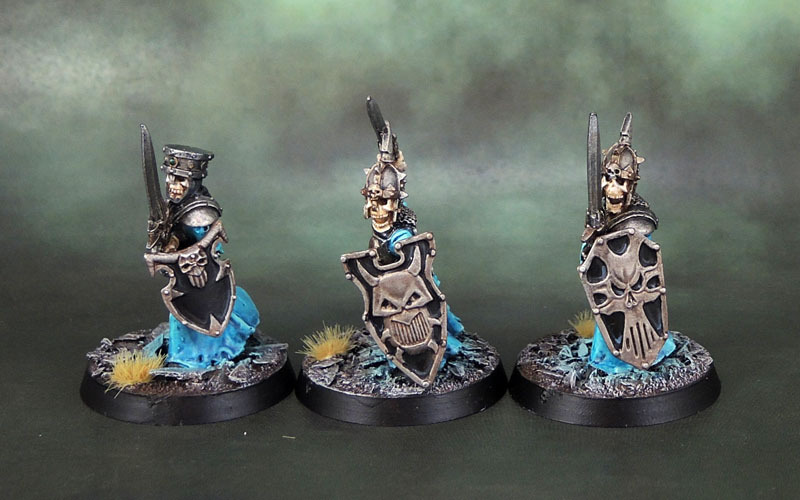 The armour and scheme is pretty simple, but I’m okay with that. It’s a 20-something year old model that’s been completed after 20 years. The paint is clean but decent – and more importantly, finished – That’s it really, and good enough for me once again. – not too much story behind this one, but it’s another neglected model completed for this month’s challenge. Now that he’s been finished and photographed, he can go back to sitting in limbo. 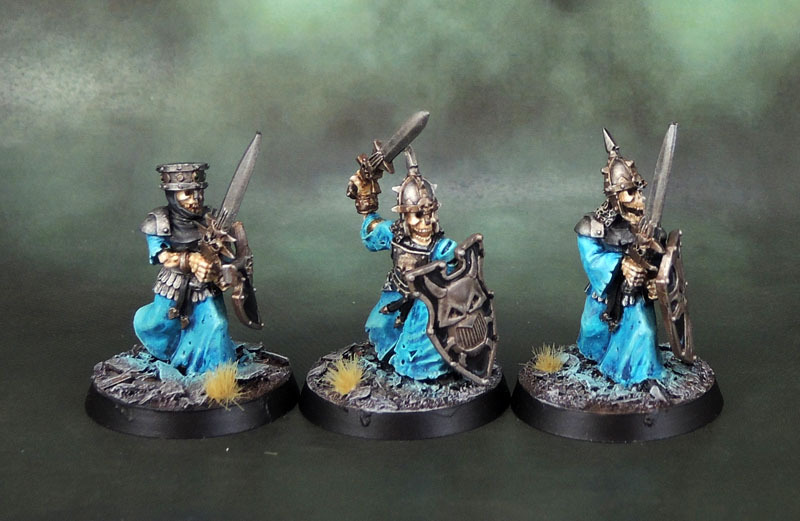 At least until he gets some mates to form a unit for games for some purpose beyond being used in board games like Frag!